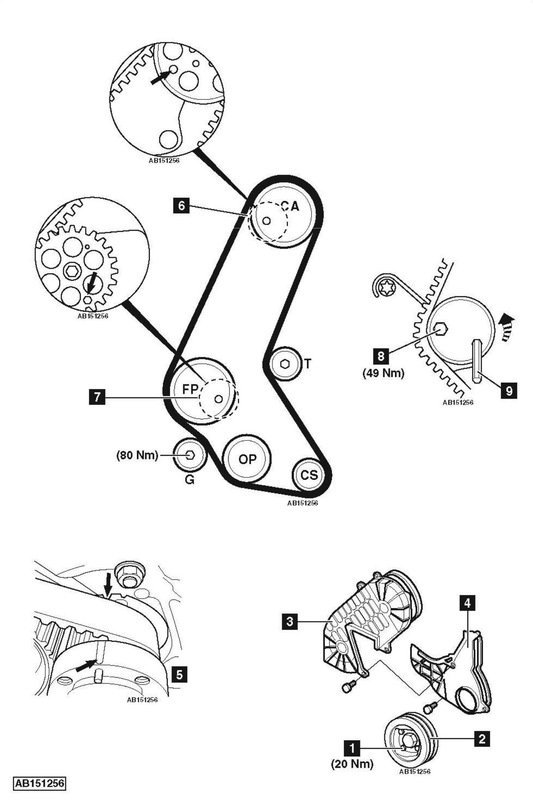 Opel Meriva 1.7 CDTi 2014 cambelt change instructions and replacement inteval. Full guide! Except Astra-J/Mokka: Auxiliary drive belt tensioner locking tool – Kent Moore No.KM-6130. Astra-J/Mokka: Auxiliary drive belt tensioner adjusting tool – No.EN-913-A. Astra-J/Mokka: Auxiliary drive belt tensioner locking tool – No.EN-48952. Air filter housing and air intake hose. Turn auxiliary drive belt tensioner to release tension on belt. Use ring spanner or tool No.EN-913-A. Lock auxiliary drive belt tensioner. Use tool No.EN-48952 or No.KM-6130. Ensure camshaft sprocket aligning hole at 8 o’clock position. If not: Turn crankshaft one turn clockwise. Turn tensioner pulley 90° anti-clockwise. Use Allen key  . Lightly tighten bolt  . Allow tensioner to tension belt. Tighten tensioner bolt  . Tightening torque: 49 Nm. Remove locking bolts from sprockets  &  . Turn crankshaft 2 turns clockwise to TDC on No.1 cylinder. Ensure locking bolts can be installed  &  . NOTE: Observe direction of rotation marks on auxiliary drive belt. NOTE: If battery has been disconnected, re-initialization of window and sunroof motors and steering position sensor may be required.